I always like to know how his business is doing because anyone that makes balloon animals for a living is working hard to make ends meet. “Well today’s been a tough day, and business is kinda slow.” I scan the market and look around as I hear the Pike Place Fish guys yell out their barking, cameras clicking away and people waiting in line to sit on top of Rachael. Within 50 yards there are probably 100 people, and it saddens me that Farrell is unable to get many donations today. A little girl walks by and asks her dad for balloon, but he hurries her along with a quick “No.” She puts her head down and obediently follows him as I watch them go to the Starbucks across the street. I feel sad for her and for Farrell as well, they both missed out on a little bit of happiness. Being that I have been in marketing mode for Shutter Tours, I talk to him about ways to market himself to get his good name out there. 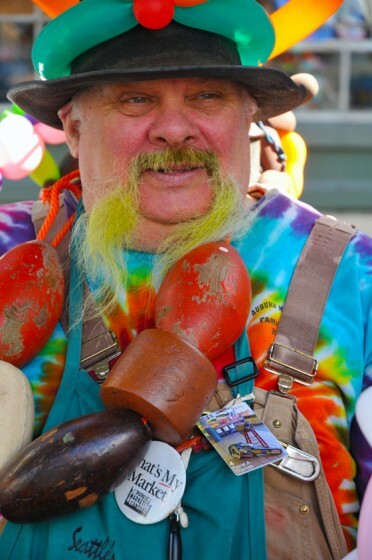 I suggest a press release (not much to release), website (Which someone offered to create for him for $350.00) and self-proclaiming himself the Mayor of the Pike Place Market (Already been done). “Maybe you could get some big silver pinwheels to attract people like fishing lures” I suggested. I started feeling it was a bit tough to market yourself like a balloon man. Maybe I need to sleep on it and think what Ivar Haglund would have done. So I told him “how about I just add you to our blog with some photos and let people know you are here?”. We agreed that was the best idea. So next time you are at the Pike Place Market, even if you don’t have children, drop some change in his bucket. A little means a lot to him and tell him Terry from Shutter Tours sent you. 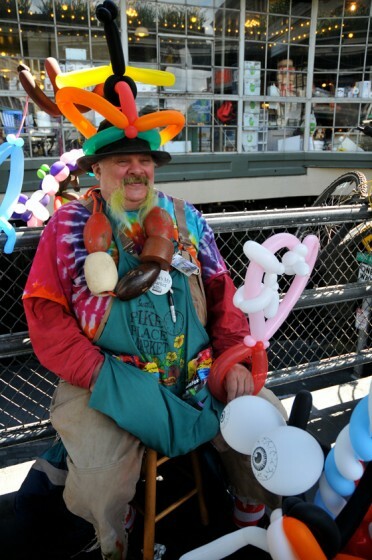 This entry was posted in Announcements, Uncategorized and tagged ballon man, pike place market, Seattle, tourism, travel, travel photography. Bookmark the permalink.